The next wave of scientists, journalists, actors, business leaders, and more—meet some of the Fordham students whose dreams are being brought within reach by the financial aid campaign. In March 2017, during the University’s yearlong 175th anniversary celebration, Fordham launched Faith & Hope | The Campaign for Financial Aid, an effort to raise $175 million to help make a Fordham education more affordable for the best and brightest students. Alumni, parents, and friends of Fordham responded by making the 2017 fiscal year the most successful single year of fundraising in the University’s history. As of April 2018, Fordham donors have contributed more than $131 million toward the $175 million goal, creating more than 130 new scholarships for students. Here are some of the people who have benefited from and supported the campaign. 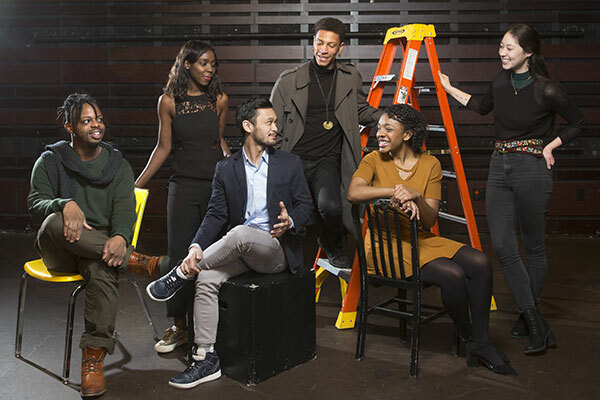 From left: actors Darby Davis, FCLC ’16, MaYaa Boateng, FCLC ’13, Daniel Velasco, FCLC ’14, Eric Lawrence Taylor, FCLC ’18, and Amber Avant, FCLC ’15; and costume designer Siena Zoë Allen, FCLC ’15. Not pictured is Cesca Wolos-Fonteno, FCLC ’17, who studied lighting design at Fordham and is currently spending a year in service with the Jesuit Volunteer Corps in California. “In a very cool, non-publicity-seeking way, Denzel Washington has been mentoring artists of color for a long time and really providing space for a lot of us to succeed,” says Eric Lawrence Taylor, a Fordham College at Lincoln Center senior and current recipient of the Denzel Washington Endowed Scholarship. As a Fordham business student, Armando Nuñez, GABELLI ’82, took the D train to Rose Hill from his home in Manhattan’s Hell’s Kitchen. 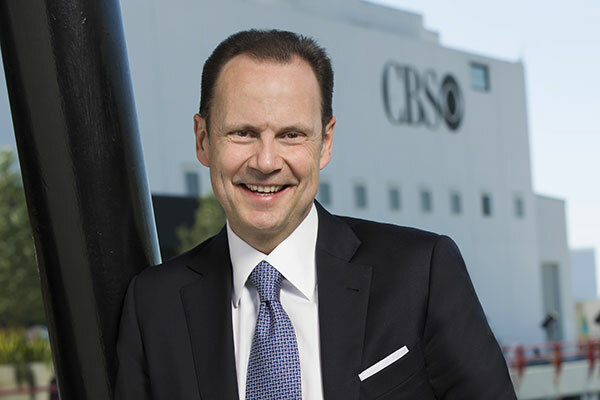 Today, when he comes to town from Los Angeles, the president and CEO of CBS Studios International looks out over his old neighborhood from the company’s 30th-floor New York executive offices. “I don’t think you can realize how fortunate you are when you’re getting a quality education. … It can take years to realize the benefits,” says Nuñez, adding that his father, a Cuban immigrant who worked in the media business, was a big proponent of Jesuit education. “The moral compass the Jesuits instill in you, the idea of being men and women for others—that drives me to do what we do for our scholarship students,” Nuñez says. He established the Nuñez Family Scholarship Fund to help give Gabelli School of Business students the same opportunities he had, and he hopes its recipients “go out to change the world—and give back themselves.” Several students receive the scholarship each year, including eight in 2017–2018. Kar emigrated from India with her family when she was 4 years old. She’s now president of the South Asian cultural awareness group as well as vice president of the Commuting Students Association at Fordham. The senior mathematics and economics major also participates in the Fordham Mentoring Program. 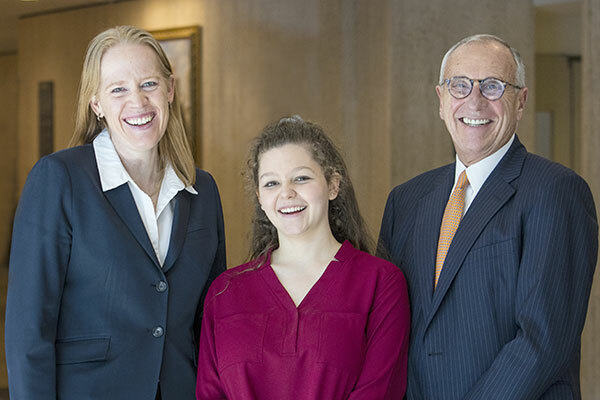 Longtime Fordham benefactor John Toffolon (right), a former University trustee, with two beneficiaries of the scholarship he and his wife established in 1995: Cindy Vojtech (left), the inaugural Toffolon scholar, who is now a principal economist at the Fed; and Samantha Barrett, a first-year student at the Gabelli School. 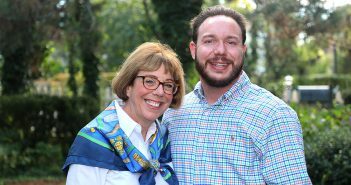 Vojtech was the first recipient of the scholarship fund created by Toffolon, a former Wall Street executive, and his wife, Joan, to support women studying at the Gabelli School, where Toffolon earned a bachelor’s degree and where both he and Joan each earned an M.B.A. Inspired in part by the Toffolons’ generosity, Vojtech recently joined Fordham’s President’s Council and has given in support of scholarships as well as the volleyball and crew programs in which she took part as a student. 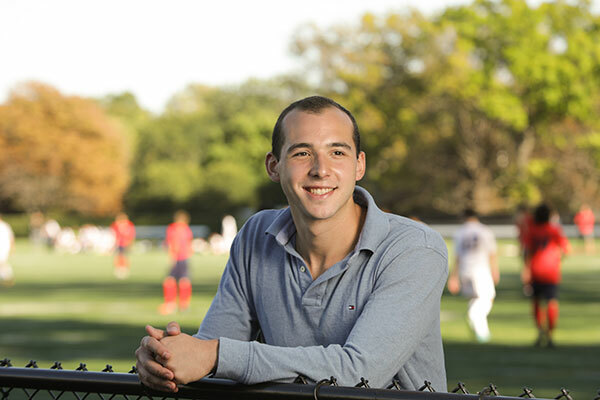 “I can’t imagine my college experience without sports,” says Vojtech, a California native. Toffolon says he and Vojtech “have a really lovely friendship.” He even co-signed an apartment lease for her when her father couldn’t, since he lived out of state. 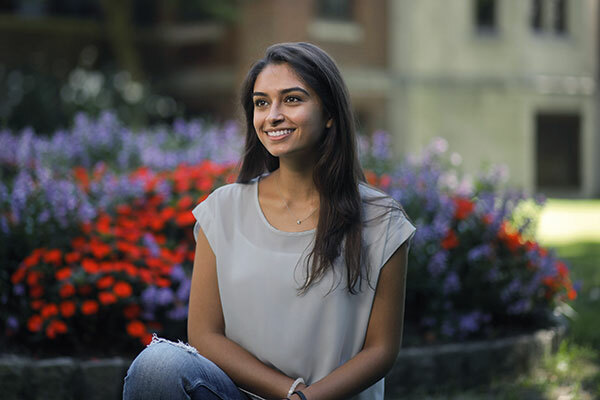 The two recently met up at Fordham, where they got to chat with the current Toffolon scholar, first-year Gabelli student Samantha Barrett, who plans to use the award to make the most of her time at Fordham. A global business honors student, she expects her studies to take her to London; Santiago, Chile; and Beijing. “I will be forever grateful,” she says. Lauren Beglin was in fourth grade when environmental experts came to her school to talk about the polluted Passaic River—two blocks from her Lyndhurst, N.J., home—and the species that were coming back as a result of cleanup efforts. The presentation fueled her interest in the natural environment, and that interest brought her to Fordham, in part because of all the research opportunities at its Louis Calder Center Biological Field Station in Armonk, N.Y.
She has since spent a summer at the Calder Center, collaborating with a professor on a study of a disease afflicting North American bats, which will be published in a peer-reviewed journal. 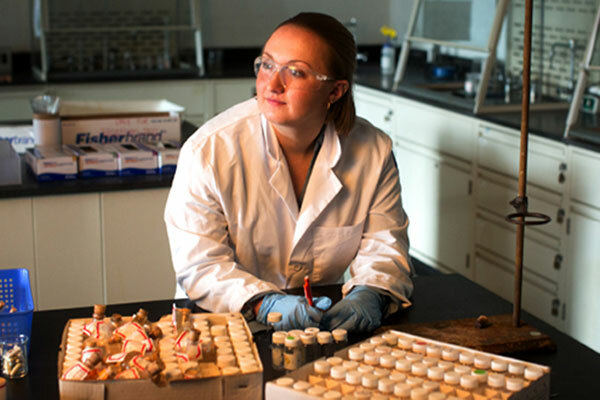 Today she is working with a chemistry professor to develop a more efficient solar cell, serving on the University’s sustainability committee, and planning to pursue graduate studies right after earning her degree in environmental science. Her ultimate goal: working for the U.S. Environmental Protection Agency, conducting research into renewable energy and ways to implement it. A Fordham Scholar and a Masterpiece at the Met: Cristóbal de Villalpando’s Adoration of the Magi (left)—a 1683 painting that has been part of the Fordham art collection since the mid-19th century—was featured in a major exhibition of the Mexican artist’s work at the Metropolitan Museum of Art in 2017. Fordham senior Peter Vergara wrote his final undergraduate seminar research paper about. Peter Vergara’s arts education began early. Born in Washington, D.C., he later moved with his family to Madrid, where he spent countless hours at the Prado Museum. “Some of my earliest memories are of just lying on the floor of the gallery,” he says. Fordham was “a huge draw” for him because of the opportunities to work in New York City and experience its art museums. 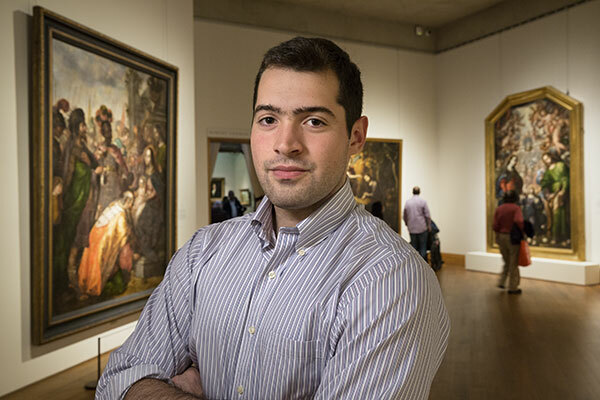 With support from his professors, he landed internships at the Hispanic Society of America; the Met Cloisters; and Sotheby’s, the global art auction house. After graduating from Fordham this May, he’ll take part in Sotheby’s prestigious 12-month paid trainee program, which prepares graduates for long-term opportunities at the company. None of it would have been possible without scholarship support. Todd Cosenza and Elizabeth Pinho-Cosenza met at Fordham and would later get married in the University Church. 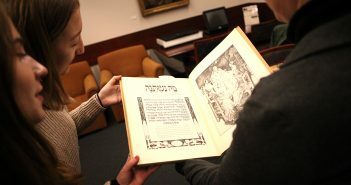 They also had similar Fordham experiences that continue to inform their efforts on behalf of the University’s students. Having graduated from Catholic high schools, they had some idea of what to expect at Fordham, but didn’t know just how much mentoring and personal attention they would receive. They also received critical help from scholarships, which only reinforced their awareness of how others were invested in their futures. Today they serve on the Fordham University President’s Council and regularly give guidance to students, among other efforts. 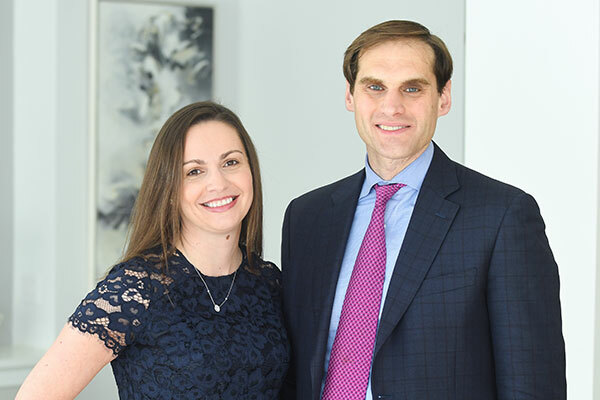 “People along the way helped me, so I think it’s incumbent on me to help others,” said Todd Cosenza, GABELLI ’95, LAW ’98, a partner at the law firm of Willkie Farr & Gallagher LLP. Fordham was appealing to Amanda Jara because of its emphasis on service, something she had always been interested in. Growing up in Bergen County, N.J., she volunteered at a summer camp for disabled children—giving them one-on-one support throughout the day—to fulfill a high school graduation requirement, and found that the work felt like anything but a requirement. “It was really rewarding,” she said. She kept volunteering at Fordham, serving at Bronx agencies including the Rosedale Achievement Center, where she was a tutor and mentor. And in sophomore year, something happened that transformed her ambitions for helping others. She was awarded a Founder’s Scholarship, which relieved her concerns about student debt and brought service-related career options into greater focus. An international political economy major who’s interested in law school, she hopes to work for a nonprofit in international development after graduating. 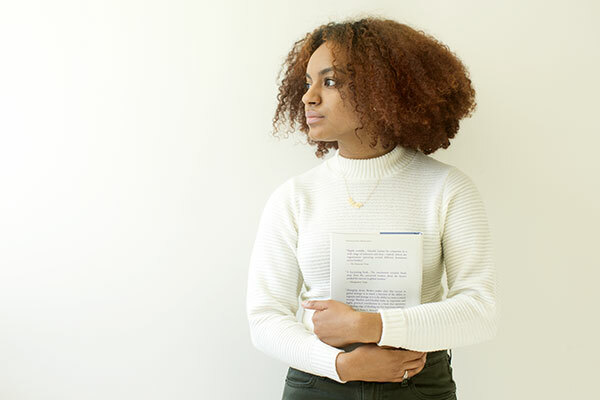 And she also hopes to one day give back in a way that’s more personal—by offering another student the kind of scholarship support that made a deep impression on her. In her first semester at Fordham, Elodie Huston began volunteering at Rauschenbusch Metro Ministries in Manhattan as part of a service-learning course in theology. She worked in programs supporting young immigrants and homeless children at the nonprofit, and the experience sparked her passion for education policy. But by her second semester, the Wisconsin native wasn’t sure she and her family could afford another year at Fordham, especially with two younger sisters who would soon be applying college. Just before her sophomore year, however, Huston earned both a J.T. Tai & Company Foundation Scholarship and a Joan M. Pease Endowed Scholarship. She later earned the Peter and Kitty Quinn Endowed Scholarship. 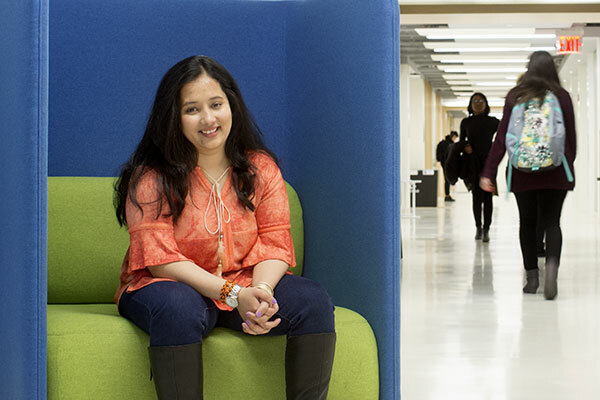 The extra financial aid allowed her to stay—and thrive—at Fordham. 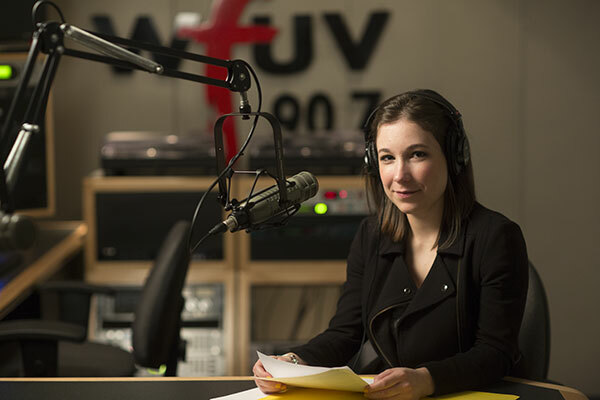 Since then, the English major has interned at a small mobile marketing startup company; revamped Lincoln Center’s literary magazine, The Comma; and worked extensively with the Office of Prestigious Fellowships to apply for postgraduate awards to further her academic career. 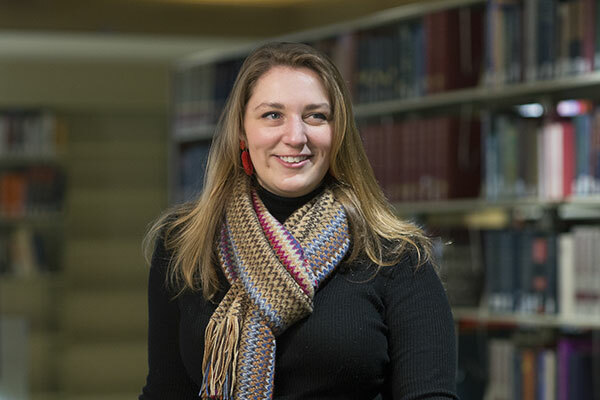 That work paid off this spring, when she earned a Fulbright English Teaching Assistant award to Germany, where she has some relatives and where some of her ancestors lived before immigrating to the U.S. in the 1920s and 1930s. After completing her Fulbright, she plans to pursue a master’s degree in international education policy.